Current commissions » Canterlot Avenue | The Roleplay & Social Site! $20 gets you a pack of three, can be different or the same character. $8 single emojis, will look in the style shown, large black outlines, simple yet accurate designs. The sized down are exactly how they look in discord. 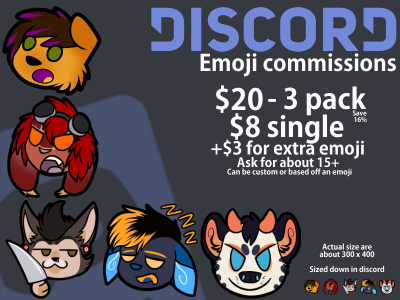 If you're interested please send me a NOTE of the emoji you want, i'll give a price, and ask for you paypal to send an invoice to! If you have any questions please don't hesitate to ask in the comments! Also willing to do a small discount on reference sheets for people with out one on here.